I was reading a devotion with my youngest daughter this morning. Some days it feels like my biggest lessons come from these and I tend to have more "ah-ha" moments than she does! Today was more a gentle reminder though. In the devotion a young boy was working on a science project about sound waves. He had read a book in which scientist believe that every word that has ever been spoken is kind of floating around in space and that one day it might be possible to hear them again. Uh-oh! There are LOTS of words that I have said that I pray no one ever hears again, including me. Those grumbles I have let slip under my breath. A lot of my speech before I came to know Jesus, and admittedly some afterwards. Our words are powerful. God used words to bring most of what we see today into creation. Proverbs 18:21 tells us that words have the power of life and death. They can turn away wrath or incite anger (Proverb 15:1). Our words can bring pain or healing (Proverbs 12:18). Do a Bible word search on words and you will see that God devotes a lot of verses to what we speak. And He promises that one day we will have to give an accounting of all of them (Matthew 12:36). But it really isn't so much that you said some unkind words. Our words are simply an outward reflection of our heart (Luke 6:45, Matthew 15:18), and that is what God is truly after. James tells us that you can say you worship God all you want to, but if the words you are speaking are not a reflection of that, then you are simply deceiving yourself (James 1:26). If you are deceiving yourself, you aren't really, wholeheartedly committed to God are you? Now, don't think I am telling you that you are doomed. Fortunately we live in a time of grace. God understands that we aren't always going to get it right all of the time, he isn't looking at what you do as much as He is looking at your heart. 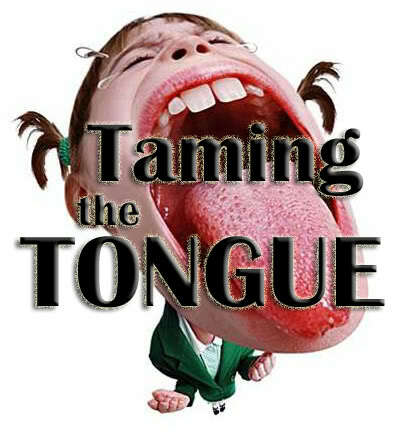 Are you truly and honestly trying to bridle your tongue and speak words that are encouraging, helpful, full of grace? Are you allowing the Spirit to convict you when they aren't and as a result repenting? Then you aren't deceiving yourself, you are learning. God gives us the guidelines so that we would understand not only what sin is, but how it hurts others. Jesus died and paid the price for every unkind word or deed we have ever or will ever say or do. The act of bridling our tongue is an act of obedience, but more so, it is an act of love. And considering how he demonstrated His love for us, it is such a small thing in comparison.